Sunday 28th April at 7.00 p.m. Certificate 12A ~ 100 minutes. “The trailer didn’t prepare me for the visceral anxiety of the film crew, their inability to watch the viewfinder as Alex performed crux moves which could have resulted in him plummeting out of frame. The close ups of Alex’s fingers on nubs if rock, his climbing shoes relying on tiny irregularities to retain grip, and his perfectly balanced moves displayed the craft of his skills. 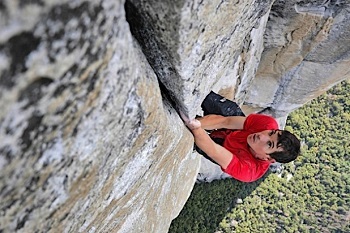 Non rock-climbers will learn an appreciation from watching this and climbers will revel”. Nominated for Best Documentary Awards.